When you need a loan fast and your credit is not in the best shape, Online Personal Loans could be the right choice for you. With its strong network of loan providers alongside an easy and straightforward approval process, the company can link you to the lender who can accommodate your borrowing needs best. 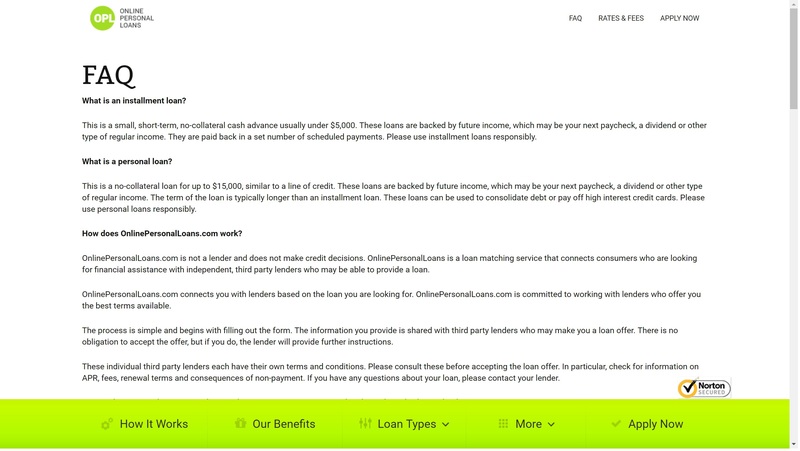 Online Personal Loans focuses on connecting borrowers to lenders providing personal loans, as well as installment loans. While they are not directly a lender, they are recommended if you are in need of a reliable and quick loan. It is important to note that Online Personal Loans is not directly a loan provider, but rather a network of applicable lenders with the goal of matching your borrowing needs and credit with the right solution. This means that the company does not offer information regarding repayment terms, as those are agreed upon once you have been matched to a loan provider. The terms can vary widely between providers. This is because Online Personal Loans offers two types of loan services: personal loans and installment loans. The term lengths for each of these options will be clearer once you are presented with a term sheet from the lender you are connected with. When you look for a loan through Online Personal Loans, the company connects you to providers that offer amounts between $1,000 and $15,000 for personal loans, or $1,000 to $5,000 for installment loans. While it is not near the top of the industry, Online Personal Loans’ offerings tend to cover most reasons for short-term borrowing. We were very happy to see that the company does not place any limits on the use and purpose of the loans. We would have liked to see a wider range of loan amounts, but overall appreciate the company’s willingness to offer alternative loan solutions for individuals exhibiting a wide range of different needs without any restrictions. Once you are approved by Online Personal Loans, the company will then connect you to a qualified loan provider to move the process forward before finalizing the borrowing terms and receiving your funding. We were pleased to see that Online Personal Loans is dedicated to informing customers about the basics behind personal borrowing and installment loans. The company features an assistive introduction to personal loans, as well as an overview of the characteristics of installment loans. Additionally, the company features a helpful FAQ section that answers some of the more common questions related to borrowing. We also found that Online Personal Loans’ blog was particularly useful thanks to insightful articles on a range of lending subjects. While we would have liked to see a live chat feature, getting in touch with the company via e-mail was simple and efficient, and they also have a number you can call. The quote application process was not very complicated with Online Personal Loans. The company does not ask for extensive sensitive information, although they do require some details to get you started. The application is a single page, and requires information including your name, drivers license or official government ID number, as well as employment and income details. All in all, it was quick and painless to transition from the initial application phase to the review process of the proper loan provider. Though they’re not a lender, Online Personal Loans is an excellent choice when you are looking for a quick and efficient way to connect to the right loan provider. The company places a serious emphasis on responsible lending and works to connect you to the right lender to fit your specific needs. While we would have liked to see a little more elaboration in some areas, we were overall pleased with the company’s efficiency, ease of use, and their extensive network of reliable loan providers.